Growing up in a Lithuanian family, there was a small group of foods that I had to love to survive, since they constantly appeared on the dinner table: potatoes, cabbage, mushrooms, herring, and beets. Fortunately for me, I loved them all, despite my Mom’s desire to boil everything to death. One of the many uses for beets, besides a cold summer soup and a hot winter soup, was pickling. Pickled beets are an excellent side dish for any hearty meat dish. (I love ’em with kielbasa!) Store-bought pickled beets pack way too much sugar in every jar, so it was time to make my own. The addition of hard-boiled eggs to the mix is a personal one. If you don’t like ’em, leave ’em out and add more beets. A real time saver is a product called Love Beets, which you can find in any supermarket. If you use them, you can skip the roasting of the beets altogether. In a medium saucepan, combine the vinegar, water, garlic, sugar, peppercorns and salt. Bring it to a boil and simmer over moderately high heat, stirring until the sugar has dissolved. 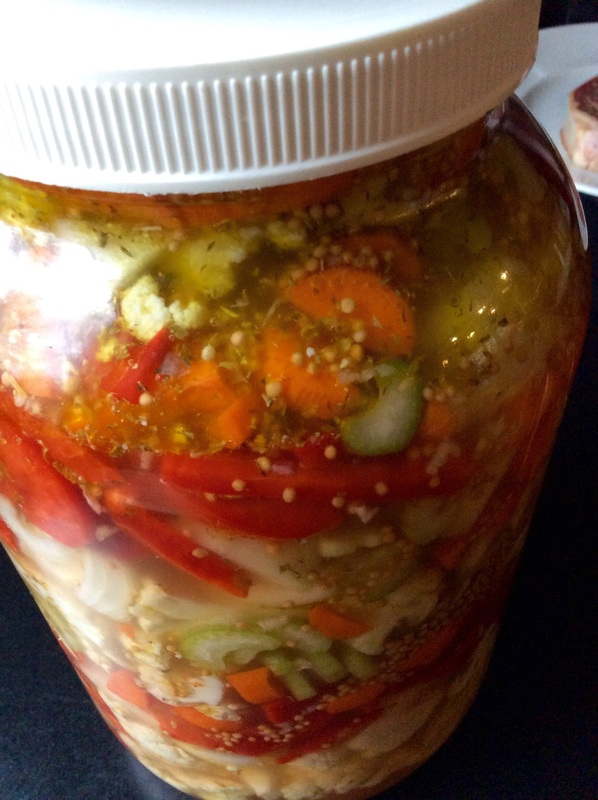 Let the pickling liquid cool to warm, about 15 minutes. 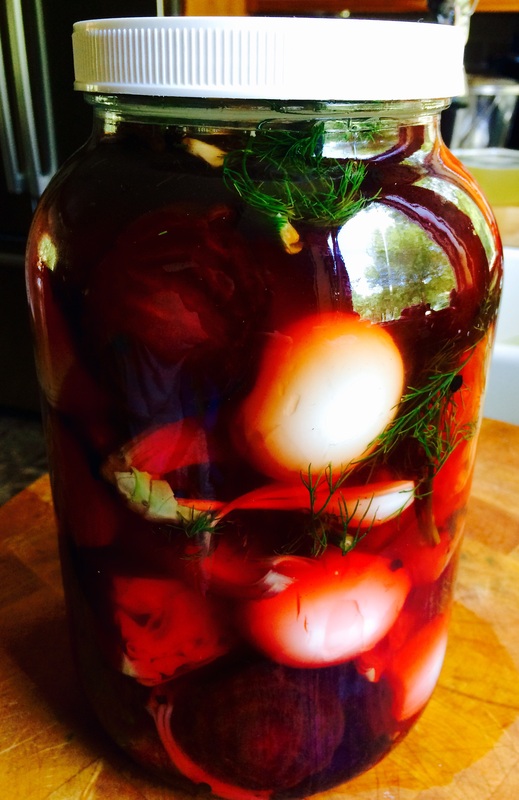 In a heat-proof glass jar or container, layer the beets, onion, eggs and dill sprigs and then cover with the pickling liquid. Let it stand at room temp for 2 hours, then place it in the fridge overnight. They stay fresh for a week, but they won’t last that long! Pre-heat the oven to 450. Wrap the beets in foil and roast for about an hour, until tender. When they’re cool enough, carefully peel and quarter them. I don’t have the patience to boil Mason jars and lids and all that crap. But I love me my pickles, especially when this year’s garden is cranking out cucumbers in record numbers! This is such an easy way to make great pickles, it’s almost unbelievable…and no water is needed! The salt extracts just enough moisture, like when curing meat, to make it work. This method works great if you want fresh pickles to eat immediately, but you’ll need to use the old-fashioned pickling methods if you want to keep them for longer periods of time. Get a large plastic bag. Add the salt, dill and garlic and gently mix everything in the bag. Cut the ends off the cucumbers and then slice them lengthwise, in half or in quarters. Add them to the bag and gently mix again, trying not to crush or squeeze the cucumbers. Roll the plastic bag tightly, squeezing the air out of the bag, then zip it and place it in the fridge overnight. The pickles will be ready to eat the next day, but they’re even better after 48 hours. My friend, Cindy, has cucumber overload in the home garden right now. Thanks to her for requesting a re-post of this recipe. I don’t have the patience to boil Mason jars and lids and all that crap. But I love me my pickles, especially when I’ve got a cucumber surplus in the garden. These won’t last beyond the season, but if you want fresh pickles in a hurry, this is a great method to use. No water is needed! The salt extracts just enough moisture, like when curing meat, to make it work. Get a large plastic Ziploc bag. Add the salt, dill and garlic and gently mix everything in the bag. 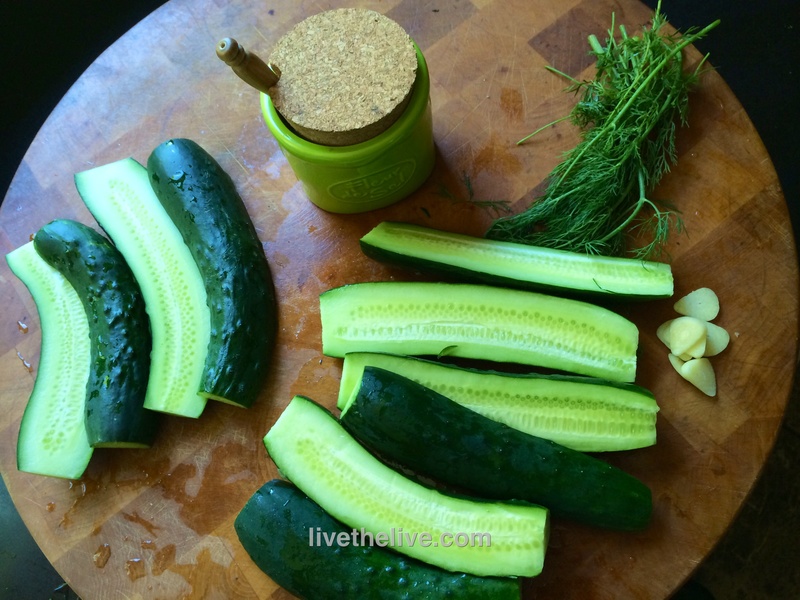 Cut the ends off the cucumbers and then slice them lengthwise, in half or in quarters. Add them to the bag and gently mix again. Squeeze to remove air from the bag, close it tightly and place it in the fridge overnight. The pickles will be ready to eat the next day, but they’re even better after 48 hours. 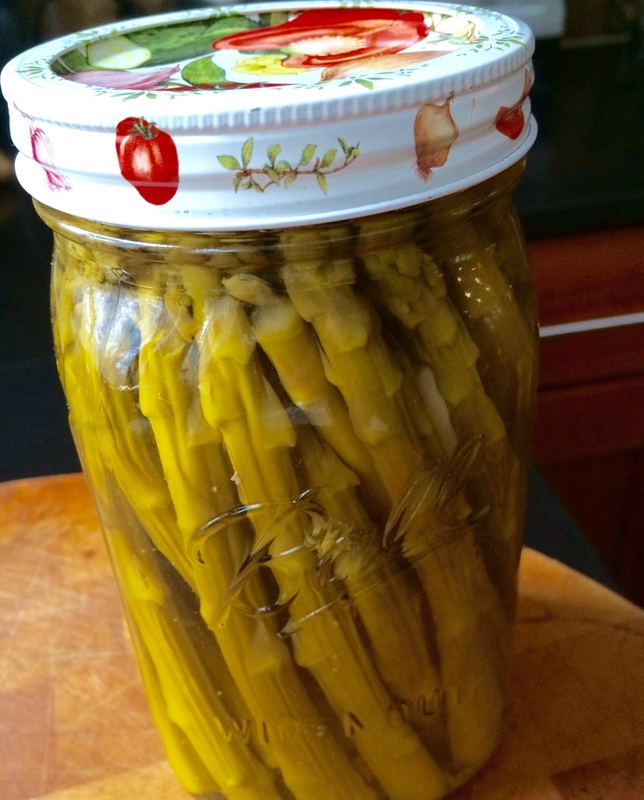 PICKLED ASPARAGUS: THE NEW SEASON HAS BEGUN! The home garden is already showing signs of activity. Overwintered kale and arugula plants are springing back to life, enough for a quick salad. Cool weather seeds that I’ve sown early: peas, turnips, radishes, broccoli raab, and others are sprouting. 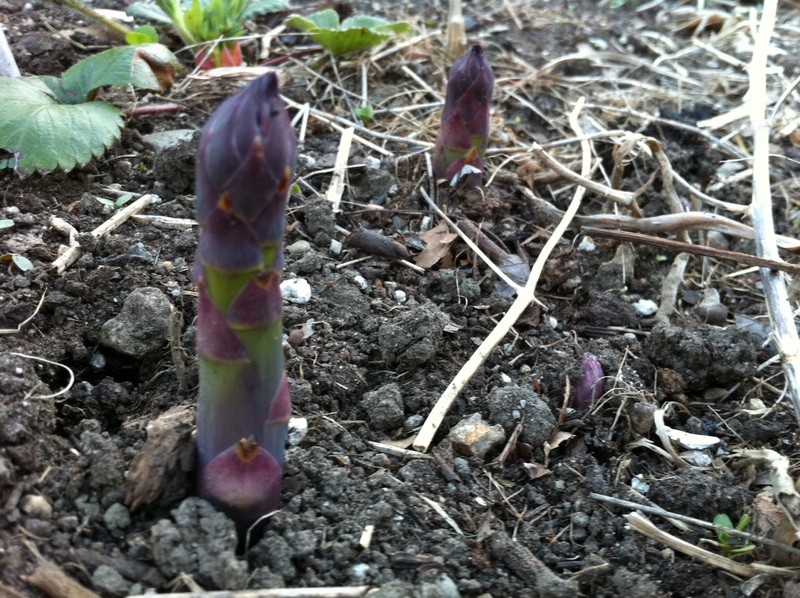 But nothing says the gardening season is here like my patch of homegrown asparagus taking off! 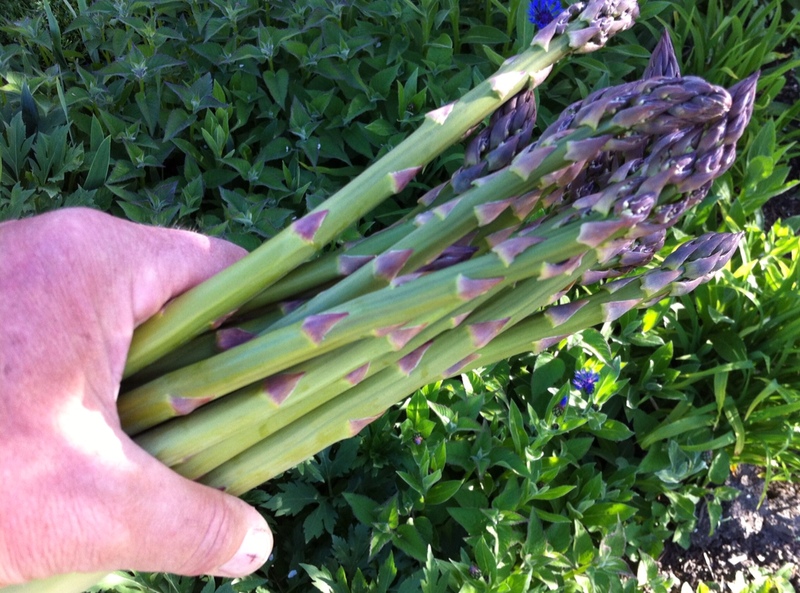 Asparagus is really easy to grow. You just need the space, and the plants practically do the rest. Space them about a foot apart, and before you know it, you will have a vast network of tasty stalks sprouting through the soil every spring. They are so much better than anything you can buy in a supermarket. In the start of the growing season, the stalks don’t even make it into the house. I cut them and just eat them straight out of the garden. Eventually, they make the move to the kitchen, where I love to simply place them on a baking sheet and drizzle a little olive oil over them. Salt and pepper…and then in a 400-degree oven until they’ve caramelized. Midway through the season, I have so much asparagus that I just don’t know what to do with them all. My friends don’t want anymore and I can’t bear to throw them into the compost pile. 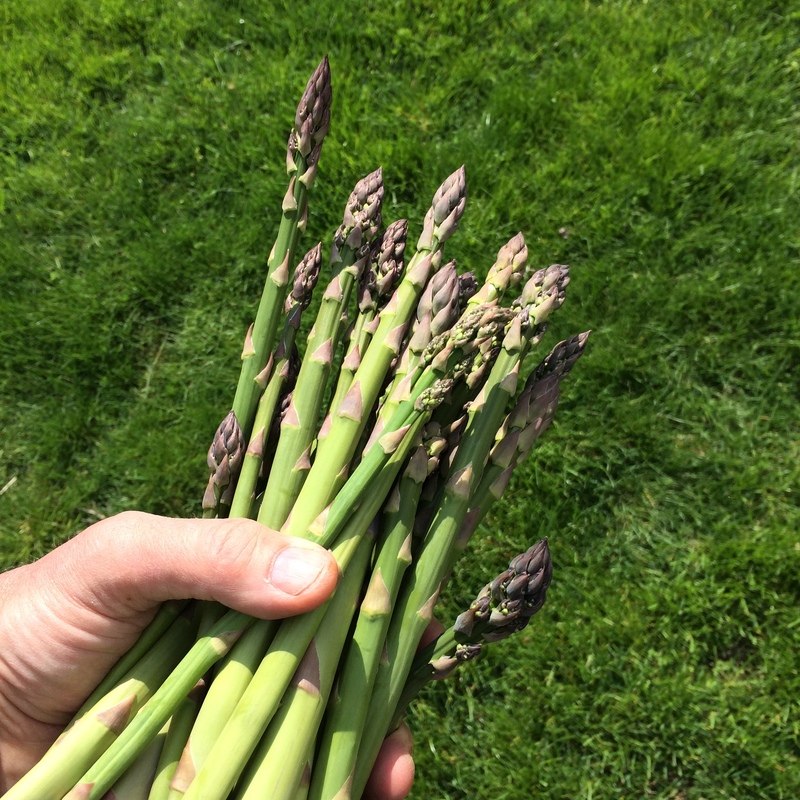 So I pickle them…a really easy process that ensures I’ve got delicious asparagus year-round. Bring the vinegar, water, sugar and peppercorns to a boil. Trim the bottom of the asparagus spears so that spears are just slightly shorter than the height of the quart-sized Mason jar you will use. Or cut into pieces that will fit smaller jars. Pack the jars as tightly as you can with asparagus spears. (They will shrink when processed.) Add the garlic clove and 1 teaspoon of salt to every quart-sized Mason jar…less for smaller jars. Fill jars with the vinegar mixture and seal. Process the jars for 10 minutes. Let them cool before placing in refrigerator. WHY DOES YOUR PEE SMELL WHEN YOU EAT ASPARAGUS? 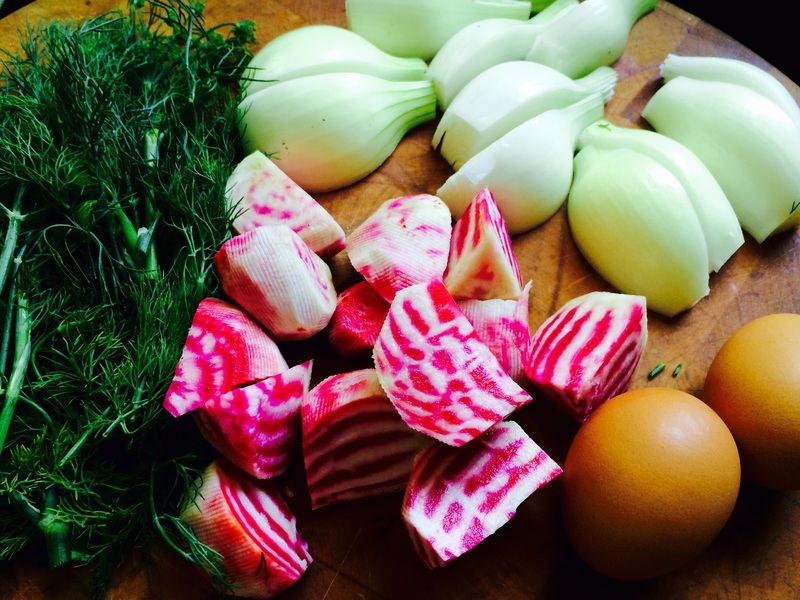 One of the many uses for beets, besides soups, was pickling. Pickled beets are an excellent side for any hearty meat dish. (I love ’em with kielbasa or steak!) I add hard-boiled eggs and hunks of onion to the mix because I like them. If you don’t like ’em, leave ’em out and just add more beets. I combined store-bought already-cooked beets (the brand is called Love Beets) with Chiogga beets that I grew in my own garden and peeled and roasted before pickling. Pre-heat the oven to 450. Wrap the beets in foil and roast for about an hour, until tender. When cool enough, carefully peel and quarter them. In a medium saucepan, combine the vinegar, water, garlic, sugar, peppercorns and salt. Bring to a boil and simmer over moderately high heat, stirring until the sugar is dissolved. 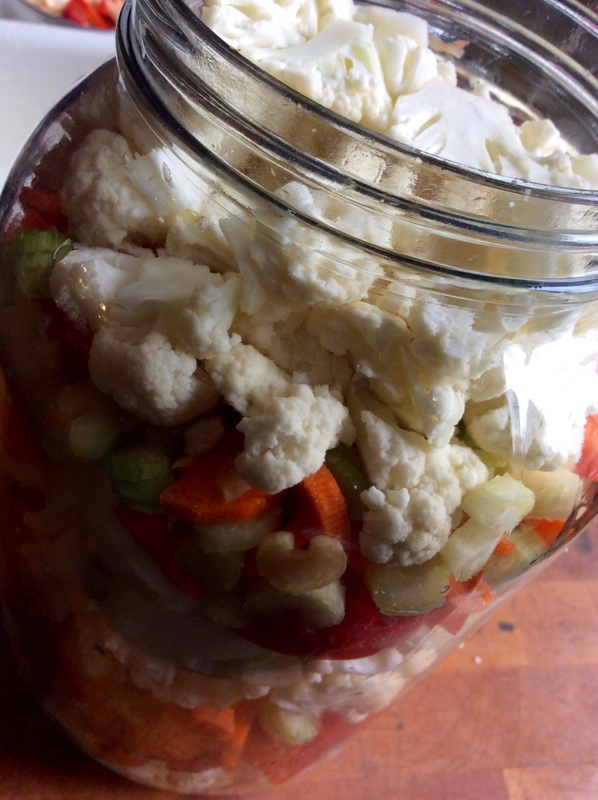 Let the pickling liquid cool to warm, about 15 minutes. 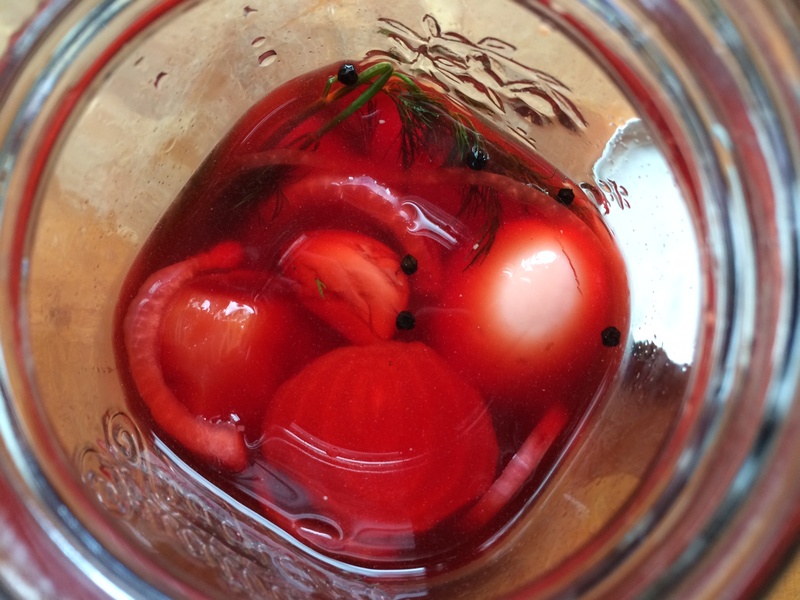 In a heat-proof glass jar or container, layer the beets, onion, eggs, and dill sprigs and then cover with the pickling liquid. Let stand at room temp for 2 hours, then place in fridge overnight. Granted, a few shoots breaking through the soil doesn’t qualify as “taking off,” but it’s an exciting time of the year in the home garden. In the start of the growing season, the stalks don’t even make it into the house. I cut them and just eat them straight out of the garden. Eventually, they make the move to the kitchen, where I love to simply place them on a baking sheet and drizzle a little olive oil over them, salt and pepper…and then in a 400-degree oven until they’ve caramelized. Bring vinegar, water, sugar and peppercorns to a boil. Trim the bottom of the asparagus spears so that they are just slightly shorter than the height of the quart-sized Mason jar you will use. Or cut them into pieces that will fit a smaller jar. Pack the jars as tightly as you can with asparagus spears. (They will shrink when processed.) Add a garlic clove and 1 teaspoon of salt to every quart-sized Mason jar…less for smaller jars. Fill the jars with the vinegar mixture and seal. Process the jars for 10 minutes. Let them cool before placing them in refrigerator. THE AGE OLD QUESTION: WHY DOES YOUR PEE SMELL WHEN YOU EAT ASPARAGUS? I don’t have the patience to boil Mason jars and lids and all that crap. But I love me my pickles, especially when I’ve got a cucumber surplus in the garden. This is such an easy way to make great pickles, it’s almost unbelievable…and no water is needed! The salt extracts just enough moisture, like when curing meat, to make it work.